Thanks to a tip from Bob Drake! 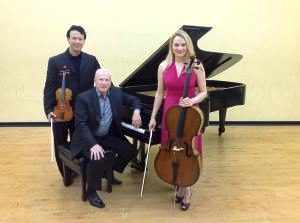 The Leaptrott Trio will perform on Saturday, March 11 at 2:30 p.m. at St. Benedict's Episcopal Church, 2160 Cooper Lake Road SE, Smyrna, Georgia, 30080. This concert is jointly sponsored by Brenau University's Department of Music and the Atlanta Alumni chapter of Mu Phi Epsilon, a national music honor fraternity. Works by Fauré, Beethoven, Schubert.